devoted husband could attend to his business. in-between her drifting in and out of sleep. worked on while sitting with her. a bag of the most wonderful assortment of feathers. Karen Curry - thank you... thank you! hold the feathers as I observed them. not always transition well in paint. (called Bunny) is molting at the moment. Thank you so much Phyllis Davis. of how light these feathers were. That - and how to make a painting out of them. 6x6in oil on canvas panel Not for sale. 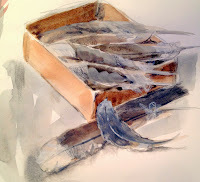 My FIRST feather painting in oil paint! I used a palette knife. next to the blue/gray of the feathers. from life. I quite liked the one with the feathers outside the box. 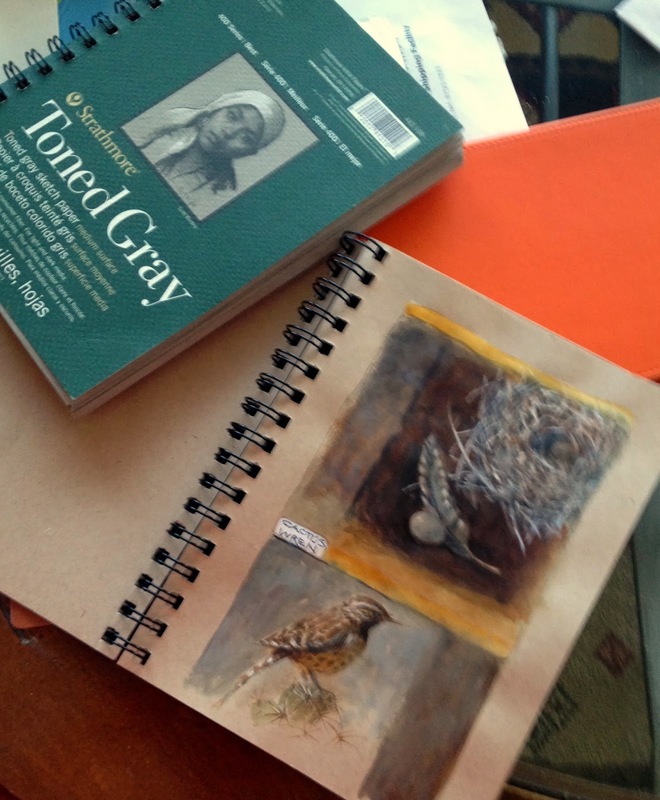 creamy oil paints while painting something very special to me. always fascinated by the discovery of feathers in the linings. that I really like and have decided to keep it for a while.. I would like you to meet Bonnie Marie. her owner's blog and she follows mine. Blanche was good enough to mail me some stunning feathers. I am lucky - the timing was great because it is molting time. to take quite a few attempts. Thank you so much Blanche - you have a heart of gold! Labels: feather series, julie ford oliver daily painter. 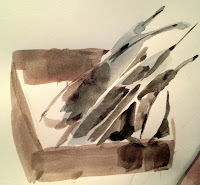 blog, parrot feathers, still life, study, watercolor, watercolor on paper. Continuing my exploration of nests and feathers. very protected among the spikes of the cactus. lots of feathers on the ground. stay away from cactus. Maybe a hawk from above? before) come in beige and gray paper as well as white.. I used the beige one for this sketch. the simple enjoyment of piddling with ideas and concepts. all on its own. Maybe in memoriam? Labels: daily painter. blog, julie ford oliver, realism, sketch, still life, Strathmore sketch book, watercolor on paper, watercolor weekends. and is the Spanish word for Flint Hill. Abiquiu Lake lies at its feet. all 9,862 feet, just for the view. Her ashes were scattered from the top of Pedernal at her request. ground, and bushes. I was testing something I recently read. My internal jury is still out on it. Painting a "site specific" view is hard on an impressionist like me. A lovely blue blur of a shape would have been much easier. a vista view of Pedernal. Forgive me Georgia - but I do love your work. 6x8in oil on canvas $125. them because they bring me joy throughout the winter. Who can resist their smiley face and beautiful colors? and I had been waiting for the live ones to come in. for a day to give them a chance of getting in touch with me. It is that time of year again. I love it! I celebrated with great pleasure when number 400 showed up. And another thank you to all my other followers. I do appreciate your support and interest in my work. I have painted this magnificent vista several times. It is northwest of Albuquerque on the way to Santa Fe. green ribbon of trees which follow the banks of the Rio Grande. a visit to the link interesting. on Saturdays, here in Las Cruces, NM. two years ago. Who would ever "thunk it"
Saturday. I have been out regularly with my camera and sketching. failures trying to get this one on the smaller square. 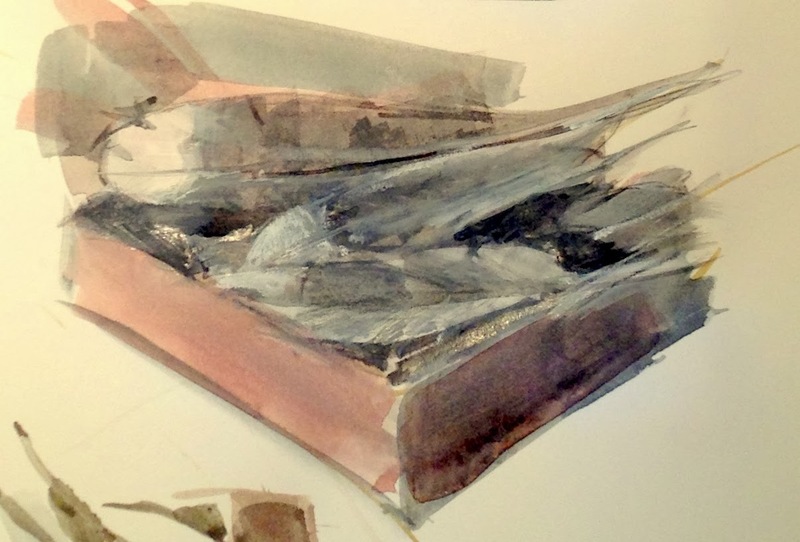 Watercolor Study - Linking Light. the light path in her paintings. dominate in a painting using linkage. possible even if only by a small area. 5. Add any texture or patterns last. of color can be added for a more traditional finish. this exercise can work well in all medias. It is fun to do! I am happy to say that he is getting better. Snow in the Arroyo, N.M.
14x11in oil on Raymar canvas panel 600.
when the storm clouds hover and it fills with rain. photograph well to show the texture.